Miriam Bannoura is not a political activist. She is not famous. Miriam Bannoura is a hardworking Christian Palestinian living just outside of Bethlehem in the village of Beit Sahour in the West Bank. She worked as a Registered Nurse for decades and is now retired, living with her husband on their modest pensions. She attends the local Greek Orthodox church and has raised four boys in Beit Sahour. At least three of her sons have graduated college. One currently lives in Germany, another in the United States, a third in Jerusalem, and the youngest in Beit Sahour near his mother. While she has done her best to raise a family in the West Bank, it has been and continues to be difficult living under Israeli occupation. As just one example, travel restrictions for Palestinians prevent free movement and she is generally unable to secure the required permits from Israeli authorities to visit Jerusalem to see her son or to attend church there for Christmas celebrations. In 1991, one of her sons was shot multiple times by Israeli Defense Force soldiers, leaving him in a coma for two months. He barely survived and permanently lost the use of his legs. He was seventeen at the time. Three of her son's friends were killed in the same shooting by the IDF. A doctor at the hospital her son was taken to after the shooting told Miriam that her son should not have been throwing stones, but she is insistent that even if he had been, and she's not sure he was, the IDF should have arrested him and not shot him and his friends until three were dead and her son was left paraplegic. Miriam Bannoura was originally a resident of the city Jaffa, the area now largely known as Tel Aviv, Israel. In 1948, when she was five years old, and "Jewish people were coming from all over" in her words, soldiers arrived at her family's door and ordered them to leave immediately under the threat of being shot to death. Her family relocated to Jordan and eventually many of them ended up in Beit Sahour, where she has lived since 1968. One of her sisters remains in Jordan and has not been allowed to return, unable to relocate to or even visit the West Bank. 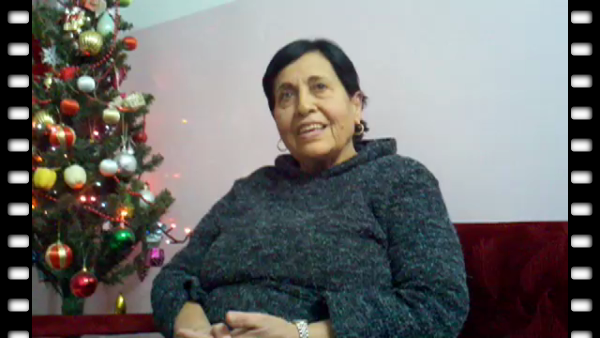 After this interview, just the day before Christmas Eve, Miriam, her husband, and the family of her youngest son secured the necessary permits to allow them to visit her other son in Jerusalem on December 25th, the Latin Christmas Day (the Greek Orthodox marking of Christmas is on January 7th). These permits are generally only available, if at all, for senior Palestinians and denied to younger ones. Other than that, the issuance of permits often seems arbitrary. But this year, for "The Feast", Israeli authorities granted permits, at the last minute, to a number of people from Beit Sahour who attend the same church and had applied for permission to travel on Christmas Day. It is unlikely such blanket permission will be granted again at any time in the near future. Despite the difficulties, Miriam hopes for a day when everyone in the region will get along in peace regardless of religion or ethnicity and the occupation she has lived under for almost her entire life will end once and for all.